Helpful hints - & Videos below! Owning or riding a dirt bike means tires will need changed. Changing a dirt bike tyre in the front is easier than changing a rear tire, though both take time. With luck, tire changes will be few and required practice time minimal. Watch someone else do it a few times to become familiar with the process. Remember the procedure and it really will get easier each time. Here are the steps to changing a rear tire on your dirt bike. •	Put the bike on a stand and take off the rear wheel. Put the axle, wheel and axle spacers and washers out of the way. Place the wheel, sprocket side facing down, on a flat solid surface. The valve stem lock nut needs loosened so you can remove the valve stem core. Without completely removing the rim lock nut, turn it until it reaches the thread ends. •	Break the bead by pushing the rim lock in with a tire spoon. Push down on the sidewalls. If you have to stand on the tire, keep your weight balanced on each side, pressing inward. The inside and outside bead needs to be broken. After you pop both sides, turn the tire over so the sprocket is facing down. Spoon off the tire, remove the tube and pull the rim free from the tire. Replace any worn or damaged parts. •	Spoon the new tire on the rim, starting at the rim lock, sprocket side down. Change the tube, if necessary, or put the old one back in, if still good. Finish putting on the tire, using window cleaner or water for lubrication. •	Air the tire. Tighten the valve stem nuts and rim lock. 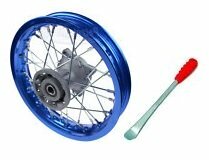 •	Clean off the axle, give it fresh grease and replace the wheel. Adjust the chain if needed. The job is finished. What is the best way to go about changing a dirt bike tire ? There are many ideas, on taking your bike dirt wheels off and getting stuck in with a dirt bike tire iron. To change a dirt bike tire, always do it when the rubber is warm (leave it in the sun if you like), you'll find it much more malleable. It doesn’t matter if they are Dunlop dirt bike tires, or just cheaper non-branded off road dirt bikes tires - Rubber softness will make the whole job easier. 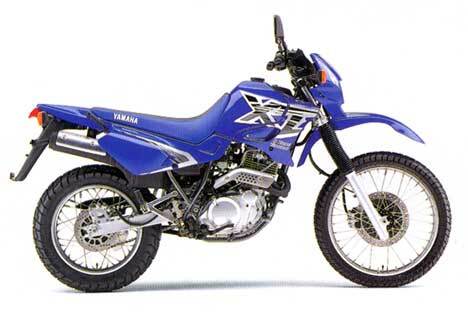 Please see our dirt bike videos on changing tires, by an expert. These 3 dirt bike video clips should leave you in no doubt how to do it. Preparation is everything so watch the dirt bike video selections a number of times, to be sure you have the steps in your head, and then away you go - take your time and wear gloves to save cuts and bruises. Most major bike models have an instruction book with the bike these days, take note of what they say and be sure you have followed all the steps. If you don’t have one, see if a friend or a fan-site can give you a copy via an emailed adobe file or lend you a copy. When changing a tire, you need to be very careful not to rip the tire, while levering it off, if your not sure a professional store will change it for you – for a small fee. Tires and brakes are your critical components, so be methodical when changing a tire and if your not sure, get a tire specialist or shop to do it for you – maybe watch while they change it and pick up some pointers. If you have punctured dirtbike tires stop straight away and check for other damage. If you continue on your dirt bike tires you may cause more problems for your bike. You can use tire levers in changing a dirt bike tire but it can be difficult and take time. 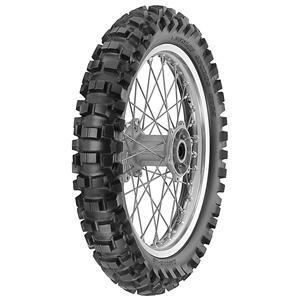 A Cheap dirt bike tire ? 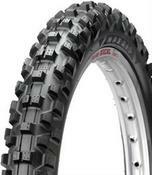 Depending on your budget you can buy expensive dunlop dirt bike tires or a cheap dirt bike tire, but if your a pro rider you should spend more on your tires than the occasional user.